Hero’s Choice is my take on the Choose Your Own Adventure books that were popular when I was a kid. Here’s how it’s going to work. I’ll be writing a chapter for a story which will end with a decision point for the reader. You will then have one week to vote on two to three potential actions the hero can take. I’ll then write the next scene and release it the following week. 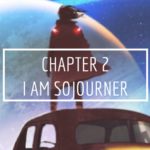 The story’s called “Sojourner: Forsaken.” In the story, you are an observer from a distant planet sent to Earth to help determine why the people of this world have begun to display super-human capabilities, but find yourself stranded and searching for a way home. Seriously, there are so many possible outcomes and paths that I have to be careful not to over-plan the story. The first chapter goes live here on the site on Sunday, June 17th. Voting will be exclusive to members of the Hero’s Choice mailing list. Members will receive immediate notification when the new chapter goes live and will also be sent a members-only link to the voting poll. However, everyone will be able to read each episode as when I post them, but you won’t get to participate in the fun part! Reminder: You will only receive the voting link if you join the list. Sound fun? Then join the list! I’m looking forward to adventuring with you. 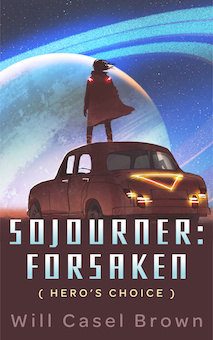 Also, huge thanks to James over at GoOnWrite.com for creating the cover. I highly recommend browsing his covers if you’re an author looking for quality pre-made covers at a great price. Stay tuned for a behind-the-scenes look at how I came up with this story from his original pre-made cover.